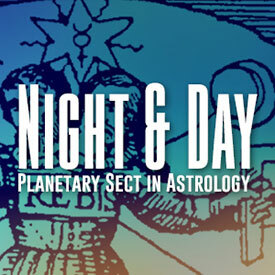 In the 37th episode Robert Hand joins the show to talk about the distinction between day and night charts in astrology, which is known as the concept of sect. Rob is one of the main astrologers who reintroduced sect to western astrology after it was rediscovered in translations of ancient texts in the mid-1990s. He wrote a book on the subject in 1995 titled Night and Day: Planetary Sect in Astrology. During the course of the episode we talk about how the concept of sect is defined, different applications of the distinction, and some of the practical and philosophical ramifications of the technique. Rob is presenting a full webinar on sect on July 26, 2015 starting at 10:00 AM PST. This will be a four-hour long workshop, including time for a Q&A session where attendees can ask questions about the technique directly. For more information about the workshop please visit Rob’s website at ARHATmedia.com. Why is it called sect? What is it useful for, or what type of distinction is sect? People with day charts experience Saturn as more constructive, while in night charts it can be more challenging. Mars is more difficult in day charts, but easier to deal with in night charts. Jupiter more positive by day, but less positive at night. Venus is more positive in night charts, and not quite as positive by day. This is a concept that didn’t survive into modern astrology, which is weird since it is such an obvious and important astronomical distinction. Sect was incredibly important in the Hellenistic tradition, but then it became less so as the tradition went on, especially by the Renaissance. Why is that? Perhaps Mr. hand answers this in his book – just wondering about the placement of a given planet below the horizon in a day chart and vice versa. For example, in a day chart Saturn is dignified. If he is placed in the 4th does this less the dignity? Also, what weight does dignity by sect hold compared to other dignities. Where can I find this information? I see this as a hierarchy starting with domicile, then exaltation, then dignity by triplicity. Please advise if you do that on this forum. Think I found that answer at 54:51 – Planetary placement in the chart relative to sect would constitute accidental dignity or debility and is a secondary consideration. The primary focus is the sect of the overall chart and the luminary that rules that sect.. In this respect sect is the umbrella of the chart under which all dignities operate. Therefore, an exalted Venus conjunct MC in a day chart is only accidentally debilitated by being above the horizon, and her debility by sect takes precedence, modified by the offset of the dignity by sign (domicile) and proximity to an angle. It is a primary focus regardless of its more self indulgent nature perhaps. Yes, that is basically correct. What side of the horizon the planet is on is a secondary consideration, and is far less important than the primary consideration of whether it is day or night and then whether the planet is inherently diurnal or nocturnal. In fact I would argue that if you put too much emphasis on the horizon consideration then it can lead you astray, and make sect much less useful/impressive as a technique, which is part of what I suspect happened in the Medieval and Renaissance periods. The Venus us exalted by proximity to MC, not sign, and in Taurus (domicile), has the highest rank if dignity. Thanks for an enlightening discussion with vast potential for practical application in chart delineation.